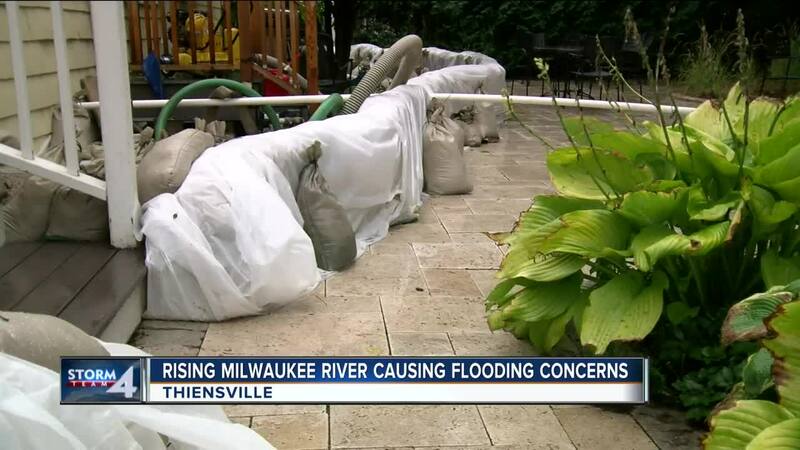 THIENSVILLE -- The public works director in Thiensville says he is thankful the National Weather Service lowered their prediction of how high the Milwaukee River could rise. As of 9 a.m. Tuesday, the NWS predicts it could rise to 14 feet, rather than 14 and a half feet. Home and business owners are left holding their breath as they brace for what could happen next. The co-owner of Fiddleheads on Main Street in Thiensville tells us the water could swell half way up his sandbags if the river rises to 14 feet. "If it went over the sandbags then our first floor would be flooded. So basement is bad news for us, first floor flooding would be significant," said Ray Mercy, co-owner of Fiddleheads. We Energies says a downed tree caused an outage affecting about 50 customers in the southeast area of Mequon. Colleen Novak is one of the customers affected. She says she's been without power since Tuesday afternoon. "You take your contact lenses out in the pitch dark you’re trying to navigate around when its pitch black," said Novak. Her basement is also flooding, "The sump pumps aren’t working. I have two downstairs. The dehumidifier is not working. I have water coming in, the walls are saturated," Novak explained. They tell us they are working as fast as they can to restore power.